It is my honor to announce the 2015 Captain of the Year Award recipient, Captain Peggy Van Vleet. Peggy has been instrumental in organizing and arranging the boats needed for the annual Fish Ohio Governor's Day for the past several years. There have always been ample boats available as well as backup boats for last minute add-on groups. As we all know organizing any multi boat event with as many as 20 boats is no easy task. It could be compared with herding cats. Peggy has also organized an annual kids fishing outing at Tall Timbers Campground in Port Clinton for a number of years. She solicits all the fishing rods, gear and any other water related equipment from many sources to make the event successful. This is a very time consuming task that she has happily taken on to the delight of many kids that will hopefully become our next generation of fishermen and ladies. The groups have been at least 30-50 strong every year. Peggy's love of fishing and the lake has made her a mentor for hundreds of new fishermen and women and her commitment to organizing this event and Governor's Day has made her a worthy recipient of the 2015 Captain of the Year Award. Congratulations Captain Peggy Van Vleet! OAK HARBOR — Dave Spangler can find fish, catch fish, and clean fish. He can also provide his clients with an enjoyable day of fishing on Lake Erie, and that makes him a good charter captain. But Captain Dave can also deftly navigate his way through the sea of acronyms that surrounds the lake and all of its pressing issues, and that is a major reason he was recently named the Charter Captain of the Year. Spangler has gone to great lengths to educate himself on the nuances of our prized waterway, so he can speak on GLMRIS (The Great Lakes and Mississippi River Interbasin Study), GLATOS (the Great Lakes Acoustic Telemetry Observation System), and address the USACE (U.S. Army Corps of Engineers) proposals for controlling ANS (aquatic nuisance species) in the CAWS (Chicago Area Waterway System). “He is much, much more than just a charter captain,” said Paul Pacholski, president of the Lake Erie Charter Boat Association, which presents the prestigious award along with the Ohio Department of Natural Resources and Ohio Sea Grant. Spangler, who was in Washington this past week lobbying on behalf of the Great Lakes, is in his third decade as a charter captain on Lake Erie. The native of Holgate grew up fishing with his dad on the Maumee River between Defiance and Napoleon, catching catfish, bullheads, and carp. Then, in the late 1970s, he discovered Lake Erie. Once a friend invited him to go walleye fishing — that was it. He was hooked. Dave Spangler of Oak Harbor was recently named Charter Captain of the Year. This is his 22nd year working as a charter captain on Lake Erie. Spangler used long weekends to start running charters while he was wrapping up a 37-year career at Johns Manville. When he retired a decade ago, Spangler had more time to charter, and to get a sobering introduction into what was ailing the lake. Involved? Spangler is now president of the Waterkeeper group and active in many other efforts to care for the lake and protect that precious resource. Those algae blooms, especially the monster bloom in 2011, gave Spangler a graphic example of how problems with the lake can have a devastating environmental, and economic, impact. During the worst of that record algae bloom, in October of 2011, Spangler went out to survey the extent of the green goo that was fouling Erie, threatening the drinking water of millions of people, and choking the life out of the lake. Spangler has attended hundreds of meetings on lake issues, given testimony in Columbus, D.C., and at other hearings and forums. He speaks softly, rather grandfatherly, but comes to the table with plenty of ammo. Spangler runs his 30-foot Grady White out of Wild Wings Marina north of here for the spring and the summer, and then moves to Huron for the fall fishery. He takes the pulse of the lake on each outing. With his leadership role in the charter boat association, his duties with Waterkeeper, and the myriad other committees and panels he serves on, Spangler still finds time to run 40-50 fishing trips a year. He said he’s not trying to make a living at it, but does it because he enjoys being out on the water. It is my honor to announce Captain Don Lowther as this years Charter Captain of the Year 2012. Don, affectionately known as Buffalo, serves as the treasurer for the LECBA. He is a full time Captain as well as being an accountant. In his capacity as treasurer Don has put the LECBA books in order and has passed every audit as well as doing the taxes for the association. 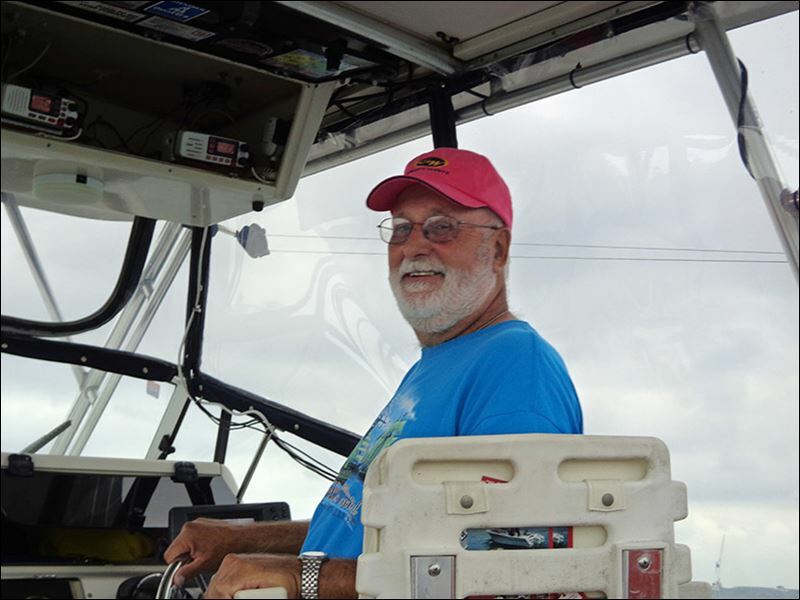 This year Don distinguished himself as an advocate for Lake Erie as well as a leader in the values of the Lake Erie Charter Boat Association. In the late summer Don approached the Board of Directors with a request that the Association sponsor a fall conference on the Health of Lake Erie. Don explained to the Board that it was vital that we get the message out to our members, businesses and concerned citizens that the lake is in trouble and that we need help fixing its problems. With the approval of the Board of Directors, Don spent untold hours advertising the conference, securing stellar speakers, and arranging a location to host the event. By all accounts this event was a remarkable success even though it was accomplished on a minimal budget and within a very short time frame. Based on these reasons, Don Buffalo Lowther was voted as the 2012 LECBA Captain of the Year!